Make your event a featured event (the bright yellow events). You can pay via credit card or PayPal, or if you prefer, give us a call and we will be happy to process your credit card payment over the phone. Featured events appear at the top of our home page, and have prominence (bright yellow) on the main calendar. If you have any questions, please contact us, or call us at (585) 283-9751. This is a one-time fee. Your event will remain featured until it's completion. Choose one of the options. You can pay via credit card or PayPal, or if you prefer, give us a call and we will be happy to process your credit card payment over the phone. Once you have made your purchase, please email us your advertisement at info@onestopmedina.com. If you need us to create your ad, please let us know. If you have any questions, please contact us, or call us at (585) 283-9751. That's only $8.33 a month! » Custom website page ($40 one-time set-up fee) - Your ad will link to a custom web page on our website. We will work with you to be sure your page has the content you desire. » A printable document - We will upload your document to our server. Anyone who clicks on your add will see and be able to print your document. » Your email. - Your ad can be a direct link to your email. » Payments can be made via cash, check, PayPal, or credit card. » Returned checks will result in a $30 fee. » Payment can be made monthly or you may prepay for an extended period of time. » You may cancel your advertisement at any time. No refunds will be given. One Stop Medina reserves the right to refuse advertising of any type. We will not be responsible for any statements or claims made in any advertisement, nor will we be responsible for any content, statements, or claims made on any external website or hyperlink from OneStopMedina.com. 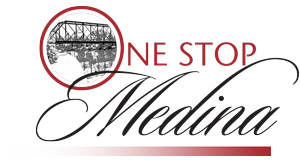 One Stop Medina will make every effort to ensure that your advertisement is professionally and neatly portrayed on OneStopMedina.com. Interested in advertising with One Stop Medina? Contact Us and we will be happy to assist you. Copyright © , One Stop Medina, all rights reserved.